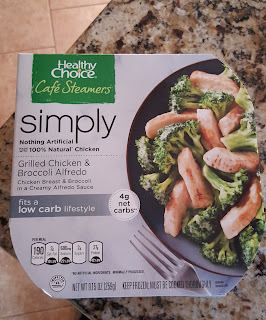 While at Target this past weekend, I found some new items from Healthy Choice in the frozen food section. This Grilled Chicken Broccoli Alfredo meal is low carb. It looks like they've replaced the noodles with broccoli and it sounds like a great quick meal to take to work for lunch. I also saw a few other varieties such as Grilled Chicken Pesto and Veggies and Southwest Chicken that were lower carb. The Alfredo one was definitely the lowest carb but all were within reason to stay under 20 net carbs per day.